I love going Instagram window shopping. There’s nothing quite like getting sartorially inspired in the comfort of my own pajamas. (Sleeper and Eberjey are my favorites, just FYI.) While going down the rabbit hole of Insta accounts these past few months, I’ve saved an abundant number of posts featuring everything from the most luxurious It bags to heavenly Manolo Blahniks and sumptuous creamy white coats (mostly from The Row). What can I say? I have expensive Insta taste. So which accounts do I follow when I’m thirsting for luxurious-looking outfit ideas? Ahead, I’m sharing some of my favorite fashion muses and their expensive-looking outfits. Here’s the best part: You don't have to spend a million bucks to look like a million bucks. While it’s fun to splurge on a designer outfit (or two)—of which I've included some pieces below—there are still plenty of affordable options to nail these fashion girls' looks. The fashion buying director of MyTheresa never fails to make me lust after lavish faux-fur coats and pretty power dresses. I could spend days ogling over the Russian Norwegian fashion muse's feed. She has a penchant for luxurious bags, shoes, and winter coats that will have you salivating. The founder of luxury retail site Moda Operandi loves playing up her look with statement designer pieces, from whimsical dresses to elegant suits. I would like to live in the feed of former Harper's Bazaar fashion editor Anna Vitiello. Her looks are straight out of a glossy magazine yet still approachable and super wearable. Playfully chic, the fashion-content maven at Bergdorf Goodman has a designer-packed wardrobe you could only ever dream of owning. 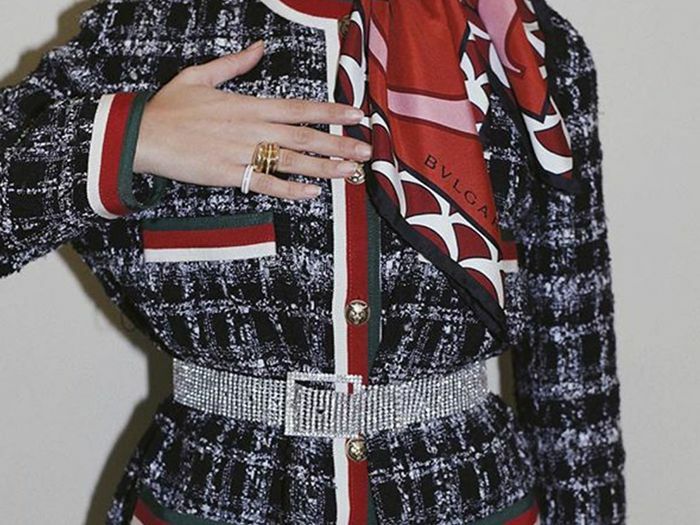 Her luxurious outfits are unique and lively, and her feed is a treasure trove of sartorial inspiration. Stylist and personal shopper Bettina Looney knows how to put together an expensive-looking outfit. Her statement looks and gorgeous collection of accessories are something to be admired. If there's one fashion muse that never fails to feed me with expensive-looking outfit ideas, it's Copenhagen native Pernille Teisbaek. Her simple yet striking looks are right on the money. No pun intended. The Stockholm native anchors her looks in high-quality staples—from ultra-chic blazers in classic color palettes to timeless Chanel flats and bags. A master at tonal dressing (which makes every outfit look inherently posher), the L.A.-based influencer has an envy-inducing wardrobe of designer items, but it's the way she styles them that makes for some very expensive-looking outfits. Up next, how to get Amal Clooney's glorious shoe collection on a fast-fashion budget.